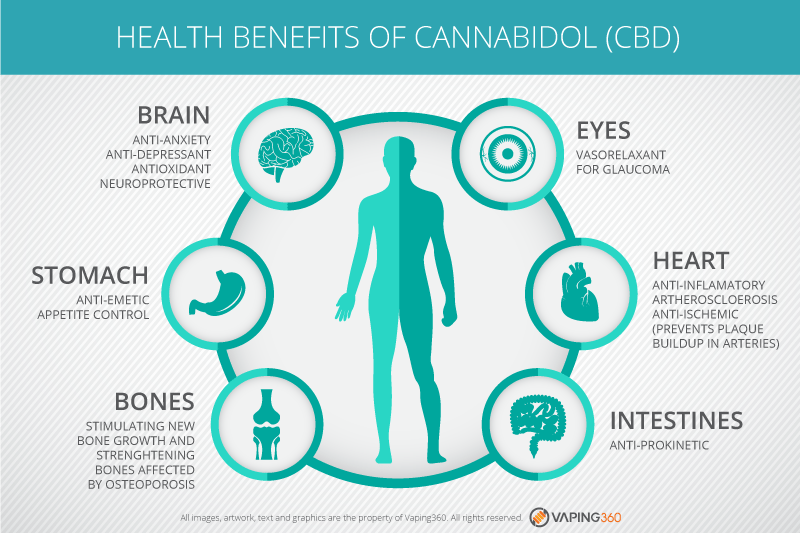 CBD benefits the body in various ways. CBD demonstrates strong medicinal and therapeutic effects for some of the most common conditions afflicting our population. The list of CBD health benefits is steadily growing as our knowledge about CBD increases. CBD benefits the body in various ways, including possible reduction of pain, anxiety, depression and much more. Unlike THC, CBD is not psychoactive. This quality makes CBD an appealing option for people who are seeking relief from pain and other symptoms without the mind-altering effects of marijuana or many pharmaceutical drugs. CBD is gaining momentum in health and wellness, partly because of many scientific studies confirming it may help treat a variety of ailments like chronic pain and anxiety. CBD is analgesic. CBD binds to CB1 receptors in the brain and central nervous system to relieve pain. Treatment for anxiety with CBD may have advantages over anti-depressants because CBD acts quickly and does not cause side effects or withdrawal symptoms. There has been limited scientific research indicating acne reduction from CBD. CBD may have beneficial effects on acne reduction due to its anti-inflammatory qualities and CBD’s ability to control the overproduction of sebum from sebaceous glands. CBD is highly effective as a sebostatic. Though these results are promising, more CBD research on acne is needed. CBD might have neuroprotective properties. Researchers believe that supplemental CBD will enhance the endocannabinoid systems and other brain signaling systems, which may provide benefits for people with neurological disorders. Some research has shown CBD to effectively treat symptoms related to epilepsy and Parkinson’s disease. CBD is useful for PTSD (Post Traumatic Stress Disorder) because CBD is known to produce effects of anti-anxiety, anti-inflammatory and anti-psychotic.